Rolwaling Tashi Lapsa Pass Trekking | Unique Nepal Adventure Treks & Expedition Pvt. Ltd. The Rolwaling Tashi Lapsa Pass Trekking trails are very eminent for their many hairpin bends and dramatic views of the mid-eastern range of the Himalaya including Gauri Shankar, Dorje Lhakpa, Tashi Lapsa, Rolwaling is located west of Everest and a few kilometers south of the Tibetan border and is known to be one of the seven hidden valleys in the Himalaya. The Rolwaling actually known as “The channel” in Sherpa language has always held a puzzling fascination. It is a wild and a little known valley and tales of the legendary Yeti, or abominable snowman, have poured from the mouths of the handful of Sherpa’s who live there. It is on the slopes of the peaks of the Rolwaling, that famous British Mountaineer Eric Shipton first photographed a Yeti track in 1951. Years later the area was also the sight for Sir Edmund Hillary’s famous expedition, whose purpose was to search for the elusive Yeti. Unfortunately he found nothing but the legend of the Yeti continues to this day. Rolwaling Tashi Lapsa Pass Trekking trail continuously heads east towards the centre of the Everest region, when you then cross the Tashi Lapsa (5755m). The trail then descends to Thame village (3800m) and then onto Namche, which is the capital of the Sherpa people. The trail then heads to Lukla for the end of the trek. It is a wonderful trek with magnificent scenery. You may visit for a once in a life time experience and it will leave cherished memories intact for life. Rolwaling Tashi Lapsa Pass Trekking is one of the best trekking high passes trekking in Nepal where is we arrange full camping trek in adventure pass trek. Day 03: Kathmandu- Shigati (1020m) by bus taking 9 hours. It is running throughout Pine forests interspersed with terraced fields and villages, crossing many rivers that flow into the Khosi Thambi. Stay at tented camp. Day 04: Shigati to Gongar (1350m) walking for 6 hours. It follows the tumultuous course of the Bhote Kosi passage on many suspension bridges. Nice views of the Gauri Shankar (7145m) and more peaks. Stay at tented camp. Day 05: Gongar to Simigaon (2020m) walking for 6 hours. After two hours we leave the valley and head east. The road rises through an impressive church land, and then crosses an area of terraced fields. Manis and chortens mark the approach of the Sherpa village of Simigaon. Stay at tented camp. Day 06: Simigaun to Donga (2800m) walking for 6/7 hours. Through a beautiful forest of rhododendron, the trail climbs gradually up Gyalche, and then follows the course of the Rolwaling Khola. Camp along the river where there are some “tea houses”. Stay at tented camp. Day 07: Donga to Beding (3690m) walking for 5/6 hours. Beding, the last inhabited village of the valley, consists of about thirty houses and a small monastery. From there you can see Melungtse (7181m), the highest peak of Rolwaling. Stay at tented camp. Day 08: Biding to Na (4180m) walking for 6 hours. Step up short Na, a small alpine village, inhabited only in summer. Nice views Chobutse (6685m) and Chugimago (6259m). Stay at tented camp. Day 09: Day of acclimatization in Na. Excursion towards the Yalung La. While the porters remain in the camp, we climb a steep slope that leads to a vast circle (4900m) crossed by streams, below the Yalung La, is the Yalung Glacier, the south Ramdung Peak (5930m) to the west Yalung Ri (5630m) and north of the border vertices Tibet. Stay at same camp. Day 10: Na to Nyiduk Kongma (4750m) walking for 5/6 hours. We climb to the dam that holds the Tsho Rolpa. A team from Hollandaise were responsible for the work rendered necessary by the growing risk of seeing the lake create a breach in a thin moraine and rush to the underlying valley along the south shore. The old road to the north shore by Chobu, always indicated by the maps, is long gone, moraine bordering the lake having totally collapsed into it. After a 300m ascent through a vast chaos moraine, we descend almost as much and it installs in a circus camp overlooking the sandy border between Lake and Tsho Rolpa glacier. Stay at tented camp. Day 11: Nyiduk-Kongma to Drolumbau Glacier 5200m walking for 5/6 hours. The trail descends on the glacier treading an impressive range of rocks which appears in some sections of blue ice. The progression becomes painful to a rocky outcrop just below the Drolumbau glacier, which is reached by a cliff that requires the use of a rope to help carriers to climb the 160m to provide access to campsites. There are fantastic panoramic views of the Glacier below and the wall of glacier ice to Drolumbau north. Emotion assured: it is at the forefront of a permanent spectacle of wild rivers that cut into the ice, falls of rocks and crevasses. Stay at tented camp. Day 13: Tashi Lapsa to Thame village (3800m) walking for 5/6 hours. To start the day, we have an easy descent before arriving in Thame, a typical Sherpa village. Here you can also visit a picturesque monastery, which is a very old monastery within the Khumbu region. Stay at tented camp. Day 14: Thame to Namche Bazaar (3440m) walking for 5 hours. See many stone walls bearing inscriptions. Visit Namche Bazaar, the capital of the Khumbu. Stay at a lodge or in tented camp. Day 15: Namche Bazaar to Lukla (2800m) walking for 7 hours. Descend into the forest and progress along the Dudh Koshi. Then a short climb to Lukla. Stay at lodge or in tented camp. Day 16: Early morning fly back to Kathmandu (35 minutes) and transfer to your selected hotel in Kathmandu. Day 18: A representative of Unique Nepal Adventure Trek will drop you off at Tribhuvan International Airport by private vehicle. Four nights in your selected Kathmandu hotel with breakfast. Accommodation in a few simple lodges, but mainly camping in twin shared tents with mattress. 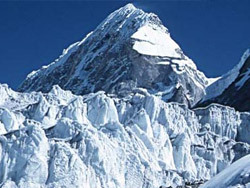 General climbing equipment such as fixed rope, ice screws, snow bars and rock pitons. One professional cook with assistant cook, Sherpa and porters to carry luggage. All expenses for Nepali staff – meals, accommodation, salary, equipment, insurance, transportation (bus/flights) etc. Transportation from Kathmandu to Sigati by bus. Transportation from Lukla to Kathmandu by flight.